You can download Monitor as a pdf file from https://www.windmill.co.uk/monitor/monitor207.pdf. * Windmill Questions: Can Windmill handle more than 10 devices? Microsoft have launched Windows 10 and messages are popping up on computers around the world asking you to upgrade. We are pleased to say that the Windmill data acquisition software works with Windows 10. One issue you may have if you upgrade to Windows 10 is with data acquisition devices that talk to your computer over USB. You might find, after the upgrade, that Windows cannot find your USB devices. The answer is simply to un-install the device and then re-install. Re-install the USB device drivers. Can Windmill handle More than 10 Devices? I want to create a distribution sorter with decentralised intelligence in the drop stations. Therefore I need to send simple asci data by rs485 to max. 250 controlled by a micro controller. Can Windmill handle communications with 250 stations? Or is the connectivity always limited to 10 devices? For more information, or if you have a question, contact [email protected]. A carpet plot is a 3-D representation of data. Excel doesn't offer a carpet plot, but there is the option of the similar surface plot. The colours and patterns in a surface chart indicate areas that contain the same range of values. The chart above plots tensile strength against time and temperature. Another example might be a depth chart plotted from a table of data with longitude values in the first column, latitude values in the top row and depth values in the interior of the table. Whilst Windmill will collect all these values, the table it saves has time in the first column and readings in subsequent columns. You can use a Pivot table to convert this to the sort of table you can use for a surface plot. To do this select the data, then, from Excel's Data menu, choose the Pivot table option. Keep clicking Next until you reach the Layout option. Drag Time to the Row area, Temperature to the Column area and Depth (sum) to the Data area. Click Finish. You can now create a surface plot from this table. 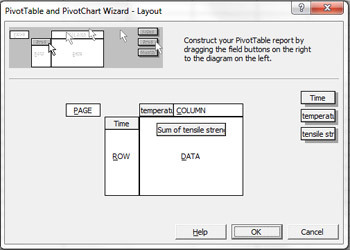 Right click the table and select Pivot Chart. A column chart will be created. Right-click on this, choose Chart Type and select Surface. Nineteen thousand sensors collect data in the Gulf of Mexico every day, feeding it back to researchers around the world. But how do the people putting the data to work judge the accuracy and reliability of the information they're using? A new project will develop the tools to gather data about the sensors so that end users know where the information came from and how it was collected. Silicon is in such demand that you'd be forgiven for thinking its position at the top of the pile was untouchable. But its status owes more to the fact that it is the second most abundant element on the planet than to its performance. Crucially, silicon's atomic structure limits its ability to conduct electricity. And that holds back computer processing speeds and the efficiency of solar panels. If electronic devices are to get faster, cheaper and more compact at the rate we've come to expect, silicon as we know it needs to be shown the door. A team of researchers from Germany and the US have developed a graphene-based light detector that is capable of reacting very quickly to light with varying wavelengths and forms. Researchers from North Carolina State University have developed technology that enables visually impaired people to monitor the vital signs of their dogs. A University of Tokyo group has developed a flexible, lightweight sensor that responds rapidly to tiny thermal changes in the range of human body temperature. This sensor is expected to find healthcare and welfare applications in devices for monitoring body temperature, for example of newborn infants or of patients in intensive care settings. The National Physical Laboratory and Building Research Establishment are investigating discrepancies between new in-situ techniques for measuring the thermal performance of brick walls and the values obtained from calculations based on long-established reference values for building materials.